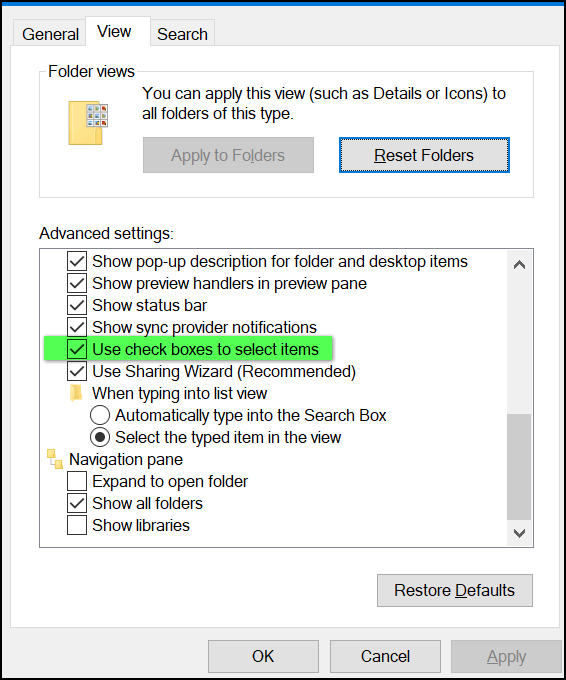 Whether you want to select all files in a folder or select only a few, there is no easier way that using the Windows Check Box feature. Trouble is, it’s not turned on by default. But don’t worry – it’s super easy to turn on. But first, if you don’t what check boxes are, we’ll show you. Here’s a list of our essays I keep in my Documents folder. I’ve selected some and not others to show you how easy it is to select files (and/or folders) with the check box feature turned on. In order to select certain files, rather than holding down the Ctrl key and selecting each file I want from a list of files, I just tick the check box. If I want all files/folders in a directory, I just tick the check box next to “Name” at the top and all files are selected. Here’s how you do it in Windows 7. 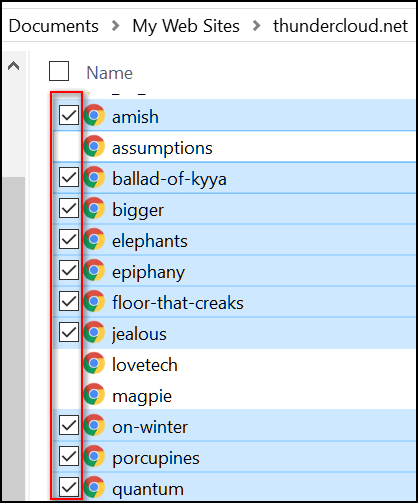 In Start Menu search type Folder Options in the search box. In the Folder Options window, click the View tab at the top, and scroll down way down and tick the box next to “Use check boxes to select items” then click Apply / OK.
You can use the Windows 7 method of turning on Check Boxes in Windows 10 too. Just search for Folder Option in the Taskbar search. Then click on “File Explorer Options” when it appears at the top and follow the instructions for Windows 7. Thank you for all your tips! I save almost all of them in a folder. Thank you Karen. Happy New Year to you and your loved ones!